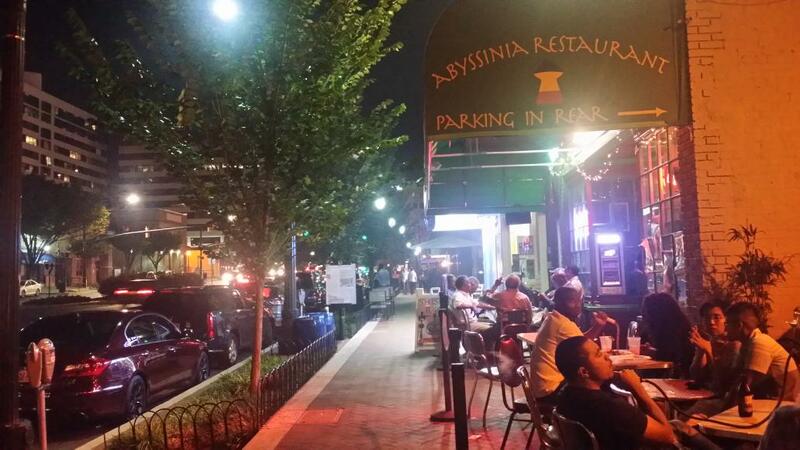 Historically, the DC area's Ethiopian diaspora has centered on Adams Morgan and Shaw. But as the community has grown, it's mostly moved out of the District. Today, the region actually has two "Little Ethiopias:" one in Silver Spring and one in Alexandria. Where the region's Ethiopian population lives. Map by the author. Ethiopians first began moving to the United States in the 1970s, fleeing a military dictatorship. The DC area has the nation's largest Ethiopian community, but just how big it is up for debate. The 2013 American Community Survey found about 40,000 people of Ethiopian ancestry in the region, while the Arlington-based Ethiopian Community Development Center says there are 100,000 Ethiopians living in the area. There's also a large population from Eritrea, which broke off from Ethiopia in 1991. The Census doesn't break out ancestry data for Eritreans for local areas. But in 2005, but the Population Reference Bureau estimated that about 2% of African-born blacks in the region, or about 2,300 people, came from Eritrea. Today, Ethiopians are the largest African immigrant group in the region, making up one-fifth of the region's African diaspora. There are about 1200 Ethiopian-owned businesses in the region, according to the ECDC, as well as the Ethiopian community's own Yellow Pages. 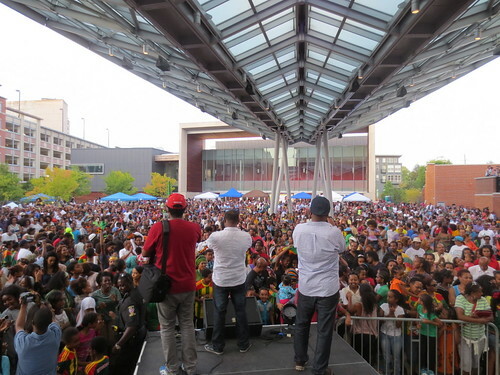 Famous Ethiopian entertainers have settled in the area, and major events serving the diaspora are held here, like this sports and live music festival that was at the University of Maryland this summer. When the diaspora began, Ethiopians arriving in DC settled in Adams Morgan, then along 9th Street NW in Shaw, occasionally called "Little Ethiopia." 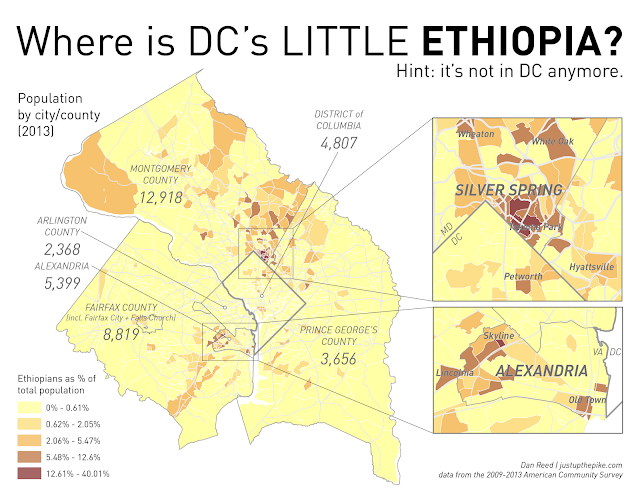 Since 2000, DC's Ethiopian population has more than doubled, from 2134 to 4807 in 2013, though it's shifted north towards Petworth and Brightwood. But like many immigrants in the region, many Ethiopians moved to Maryland and Virginia, and today most of the community lives outside the District. Montgomery County has the region's largest cluster of Ethiopians, with nearly 13,000 residents claiming Ethiopian ancestry, three times as many as in 2000. Fairfax County and the city of Alexandria have the region's second- and third-largest Ethiopian populations. Ethiopian nightlife in Silver Spring. Photo by Reemberto Rodriguez. Today, there are two "Little Ethiopias." One sits in Silver Spring and Takoma Park, and reaches into far northwest DC. Another is in Alexandria and extends west towards the Skyline area of Fairfax County. Both areas are home to several thousand people of Ethiopian descent. Ethiopians make up 29% of one Census tract next to downtown Silver Spring, while one census tract in Alexandria, consisting of a large apartment complex called Southern Towers, is 40% Ethiopian. The most prominent sign of the region's "Little Ethiopias" is food. Downtown Silver Spring has dozens of Ethiopian eateries, and with those numbers come specialization: there are white-tablecloth places, sports bars, an "Ethiopian Chipotle," and of course, many different coffee shops. Meanwhile, chef and TV personality Anthony Bourdain visited an Ethiopian market in Skyline on the DC episode of his show No Reservations. Montgomery County's annual Ethiopian Festival in Silver Spring. Photo by Alan Bowser on Flickr. These communities are also gathering and economic hubs not only for Ethiopians, but the wider African diaspora living in the DC area. Silver Spring is home to I/O Spaces, a coworking space geared to the African community. Montgomery County, which hosts an annual Ethiopian Festival in Silver Spring, is also the first jurisdiction in the nation to name September African Heritage Month. Will "Little Ethiopia" continue to move farther out? Why did Little Ethiopia, like so many other immigrant enclaves in the DC area, leave the District? Gentrification and displacement may be one cause. Though it's also likely that people moved to Maryland and Virginia for cheaper housing, better schools, or to be close to friends and family. It'll be interesting to see if the region's Ethiopian population continue to move further out. There are already large concentrations of Ethiopians extending far from both Little Ethiopias: the one in Silver Spring stretches north towards Burtonsville, while the one in Alexandria continues south along I-95 towards Lorton. So interesting, thanks for sharing. I live at 14th & Colorado and there are many Ethiopians in the neighborhood (residents and businesses / biz owners). I feel this happened some time ago. Silver Spring has had a tremendous Ethiopian presence since at least 2008 when I moved there. I didn't see a way to e-mail you, but if you are interested in sharing Free Family Friendly events. Clarksburg Village Center is a hosting a free Trick-or-Treat afternoon on Saturday, October 31st from 1-3 pm. The link with more details is below. I hope you will consider sharing.